If you’re looking for a fine piece of wood, you’d be hard put to improve on a slab of hinoki (Hinoki cypress, Chamaecyparis obtusa) from the Kiso Valley straddling Nagano and Gifu prefectures. The sparsely populated district is home to the only natural hinoki forests of any size left in Japan. The timber they yield is pale golden, fabulously fragrant and soft yet strong. At 300 years old or more, they’re also larger than anything found in Japan’s many man-made hinoki forests. That, at least, is what Masaru Taguchi will tell you. He ought to know. As director of sales at Ikeda Lumber Co. in Agematsu, a small town in the heart of the Kiso district, he sells timber from its forests (both natural and plantation) to temples and shrines throughout the country. Among those customers is Ise Jingu in Mie Prefecture, Japan’s foremost Shinto shrine. Every 20 years, 65 structures there are rebuilt top to bottom from gleaming hinoki. The ritual is a symbol of religious renewal that consumes 10,000 of the finest trees; Kiso supplies three-quarters of them. “We have the best hinoki in all of Japan,” Taguchi boasted with a smile on a recent winter’s morning, showing me the piles of hefty logs in his yard. However, he may soon have less of that prime lumber to offer. Centuries of logging have pushed Japan’s temperate conifer forests — where hinoki trees naturally grow — to the brink of extinction. The last sizeable scraps are part of a national forest whose trees are selectively harvested under the direction of the Forestry Agency and then auctioned off to companies such as Ikeda. Now, though, the agency is preparing a new conservation plan that will reduce the number of big trees felled. This follows charges from ecologists and activists that current management practices could wipe out an important ecosystem. 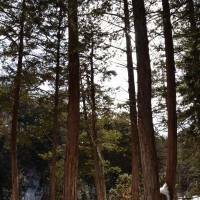 “Over a period of more than 1,000 years, Ise Jingu (and other shrines, temples and traditional buildings) have erased large natural hinoki trees from Japan. It takes 400 years or more for the trees to grow that big. Supply doesn’t come near to keeping up with consumption,” said Ryuichi Yokoyama, director of the Nature Conservation Society of Japan, who campaigns for the protection of Kiso’s forests. Ise Jingu manages plantations in Mie, but they will not yield the large logs demanded by traditional structures for another century or more. Hinoki grows wild only in Japan and Taiwan, and is listed by the International Union for the Conservation of Nature as “near-threatened.” Japan’s temperate coniferous forests also harbor more than 20 other evergreen species, including hiba (Thujopsis dolabrata) and Sawara cypress (Chamaecyparis pisifera). Plantation forests tend to be less diverse because they are densely planted with a single species and, with lumber prices low, are often poorly managed. Set to be finalized in March, the Forestry Agency’s new plan for the Kiso Valley calls for a 16,579-hectare conservation zone divided into three areas. These comprise a 3,874-hectare core of almost entirely natural forest to be strictly protected; another core area that is three-quarters plantation forest, to be gradually transitioned to a more natural state; and a third area of mixed natural and plantation forest that will serve as a buffer zone. “This represents a huge turnaround in policy direction,” said Shinichi Yamamoto, a forest ecologist and vice president of Okayama University who helped shape the plan. “Up till now, we’ve had conservation — but not active restoration. The buffer zone is also a new element. I think it took a lot of courage for the Forestry Agency to move forward with this,” he said. On the ground in the Kiso Valley, however, local officials who will eventually implement the plan face difficult challenges. “The question of the lumber industry’s survival, and the survival of traditional culture still needs to be resolved. How many trees need to be cut to maintain that culture?” said Shinji Takashima, director of the agency’s Kiso District Forest Office. 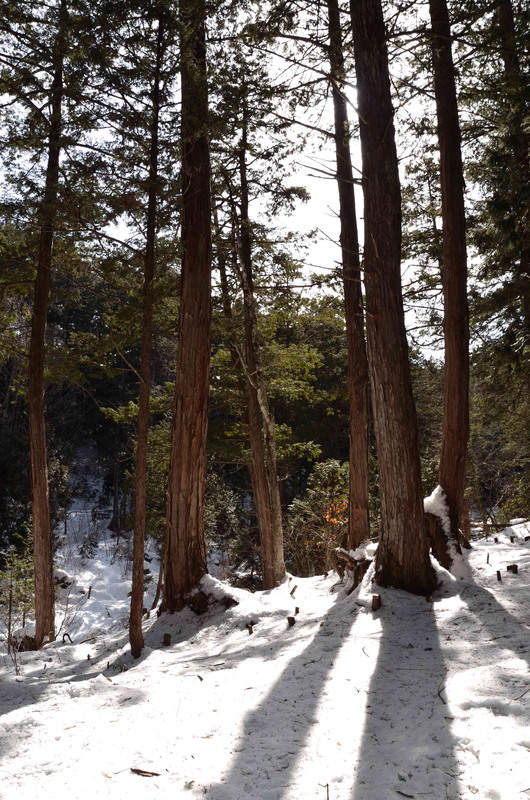 Takashima had driven half an hour from his office, donned snowshoes, and trekked into the Akasawa Natural Recreational Forest to show me a small section of temperate coniferous forest that is already protected. We followed the trail along a stream swirling between snow-topped rocks. On either side stood a mixture of small and medium-size conifers. The trees grow slowly, and their size belies their age. “That tree is probably 350 years old,” said Takashima, pointing to a graceful hinoki rising from the side of weathered stump. By the early decades of the Edo Period (1603-1867), he explained, most mountains in the region had been heavily logged; the old stumps visible throughout the preserve are evidence of that plunder. After new regulations were enacted in the mid-1600s, though, the forests gradually recovered. Later, Akasawa became one of Ise Jingu’s special harvesting grounds. After World War II it was designated a national forest. A bit further on, Takashima gestured to a cluster of thin, dark trunks. “See those — they are hiba. They like this dark environment, and eventually will take over. Hinokis are just a midpoint in the natural succession here, but many locals want us to maintain a brighter forest so more of them will sprout and they can keep using them as they have since the Edo Period,” he said. The new conservation plan delegates such issues to an expert committee that will make management decisions and weigh requests to harvest big trees for special uses such as religious buildings. “We have to balance the protection of our environmental heritage with the protection of our cultural heritage,” Takashima said as he headed out of the snowy forest. Whether he and his colleagues are able to do so may determine the future of Japan’s natural hinoki forests.